Prof. Roger Pielke, Sr., is emertus professor of the Department of Atmospheric Science at the University of Colorado, Boulder. He is also a fellow of the American Meteorological Society and the American Geophysical Union and was Co-Chief Editor of the Journal of Atmospheric Sciences. He has also been highly critical of the way that the Intergovermental Panel on Climate Change has played fast and lose with the facts in the past, in order to bolster their political agenda on global warming. Pielke also runs a website where he posts material on the climate debate every so often. He recently published a guest post by Dr. Madhav Khandekar. Khandekar has a master's degree and a Ph.D in meteorology and has worked in the fields of climatology, meteorology and oceanography. He was also an expert reviewer for the IPCC. Khandekar wrote about the claims regarding the melting of Himalayan glaciers. He notes that recently Dr. V.K. Raina released a major study of 20 glaciers int he Himalayas which was released by the Indian Minister of Environment and Forestry. But the report got immediately attacked by Rajendra Pachauri, the head of the IPCC. You may remember that the left-wing Guardian newspaper called Pachauri one of the "world's leading climate scientists" even though the man has no degrees in a field related to climate at all. He studied engineering and economics. But the qualifications for being a warming expert, if one is hysterical about the issue, are quite low. However, remember that skeptics, no matter how highly qualified they are in their field are to be viewed, well, skeptically. Actually I lie—they are to be villified and attacked and viewed as climate traitors. One major warming website argued the skeptics should be put on trial for their views. My view on Pachauri is here. Pachauri attacked Raina because his study of the 20 glaciers contradicted the warming orthodoxy. Raina, a senior glaciologist, said that one must be cautious in claiming that the warming is melting the glaciers. He found that glaciers are moving in contradictory ways. Some have retreated a great deal, others have barely budged while others are expanding. Most have been shrinking since the end of the last mini Ice Age. Raina mentions the erratic behavior of some glaciers. Gangotri was retreating 20m per year until nine years ago when it slowed considerably. Since 2007 it hasn't moved at all. Siachen advanced 700m between 1862 and 1909, then retreated 400 m between 1929 and 1958 and then has retreated only slightly. Glaciers near each other may act quite differently. Even the same glacier can act differently at the same time. Chong Kumdan has three limbs to the glacier. One limb advanced until 1990 and then retreated slightly. Another has been growing continuously. A third limb retreated until 2001 and then started expanding again. Raina argues that snow precipitation is the main factor in glaciers growing or shrinking and that climate plays a small role. Precipitation can vary greatly depending on local factors where climate does not. He said that the indication that glaciers don't grow based on immediate climate factors because, if they did, then "all glaciers within the same climatic zone should have been advancing or retreating at the same time." This is what got Pachauri's knickers in knot. This doesn't confirm the official scare story of the IPCC. So Pachauri launched an attack on Raina claiming that the IPCC itself has claimed the glaciers in the Himilayas are likely to disappear by 2035. That's just 25 years away people. And the IPCC's 2007 Working Group II report does say just that. According to the IPCC the Himalayan glaicers "are receding faster than in any other part of the world and, if the present rate continues, the likelihood of them disappearing by the year 2035 and perhaps sooner is very high if the Earth keeps warming at the current rate." Khandekar wondered where the figure came from. He finds that the Russian scientist, V.M Kotlyakov wrote a paper which is the source for the claim. Kotlyakov is a climate catastrophist. But there is a problem which you can find on page 66 of his paper, which you can find in pdf format here. Kotlyakov actually wrote that he estimate a the shrinkage to be "from 500,000 to 100,000 km2 by the year 2350." 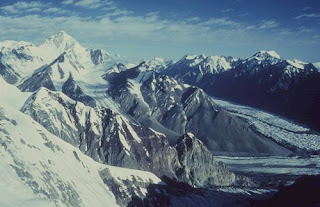 He did, however, say he expected glaciers in the Himalayas to survive. But notice something important. Kotlyakov estimated the shrinkage would take 3 1/2 centuries, not 25 years. The IPCC was just sloppy and transposed some numbers, turning 2350 into 2035 thus cutting the panic period from almost 340 years to just 25. Pachauri's criticism is based on a typo in the report of his own bureaucracy. He may be the world's leading climatologist (said with tonque firmly in cheek) but the figures he is quoting is off by several centuries. Worse for Pachauri is that other specialists have backed up Raina. Bjorn Lomborg recently wrote of those scientists in the Wall Street Journal recently. Perhaps is a spirit of slightly more skepticism since the Climategate scandal, the BBC has reported on this major boo-boo. They quote Michael Zemp, of World Glacier Monitoring Service, as saying the IPCC's claim that it is "not plausible that Himalayan glaicers are disappearing completely within the next few decades." Prof. J. Graham Cogley, who discovered the source for the IPCC's error says he is astonished that none of the 10 major autors of the 2007 IPPC Report bothered to verify the claim and check its source. It confirmed their own catastrophist beliefs so I'm not surprised that they took it as gospel truth. So how did Pachauri respond to the news that his dire warning about 2035 was off by a few centuries? According to the BBC his reply was: "I don't have anything to add on glaciers." The IPCC authors in question insist they got the facts right however. Author Murari Lai cited several sources including a World Wildlife report, a UNESCO document and a 1999 news report in New Scientist. Without more information to the contrary it appears the UNESCO document is the Kotlyakov paper. The BBC, however, points out a problem with these citations: "None of these documents have been reviewed by peer professionals, which is what the IPCC is mandated to be doing." India's Environment minister, Jairam Ramesh, disputed the IPCC's report on glaciers in his country calling the clams "alarmist" and false. Top glaciologist have since released a statement condemning the IPCC, even though most of them are IPCC participants. They said: "This catalogue of errors in Himalayan glaciology... has caused much confusion that could have been avoided had the norms of scientific publication, including peer review and concentration upon peer-reviewed work, been respected." Zemp said that under IPCC rules the claim "actually should not have been published as it is not based on sound scientific reference." Things are even worse for the IPCC than appears here. Lai says that three sources were used. One of them was the WWF report. But the WWF merely quotes a second source. It cites the New Scientist news report as the actual source for the claim. But IPCC author Lai lists the New Scientist article as a third source. So it isn't. One source merely quotes the third source. But even that one source is quoting another source and can't be credited as a source. These sources then seem to be pointing to a report from the International Commission on Snow and Ice, a report that was hard for researchers to find. And when it was found, and read, it turned out to say nothing to back up what the IPCC claimed. So, instead of using peer-reviewed papers as required, the IPCC relied upon secondary reports pointing to another paper that didn't actually say what the IPCC was reporting. And it gets worse. The IPCC claim reads almost the same as a piece published by India Environmental Portal here. That report quotes the Kotlyakov report but transposes the numbers, just like the IPCC report did. The sentences used are almost identical. Sections from the one report are lifted almost verbatim and published by the IPCC. It appears that not only did the IPCC use non-peer reviewed citations for their astounding claim about glaciers but their author appears to have plagarized the material from the IEP site. And the danger with that is if you steal from a source that made errors you will repeat their errors verbatim along with the rest of the material you borrowed without citation. As for Pachauri, he dismissed the report that the Indian government published saying it wasn't "peer-reviewed." That is pretty audacious considering the claims his agency published were not peer-reviewed either and were lifted verbatim from a report that got the numbers wrong. To have this happen right on top of the Climategate episode does not bode well for the IPCC and it's political agenda. Whatever case the skeptics may or may not make on warming, the antics of the IPCC and the top warming alarmists around the world gives more than enough reason to see this more as a political movement than a scientific one. posted by blog owner at 12/24/2009 07:22:00 AM DiggIt! Reddit Del.icio.us Slashdot It!